A fine bank holiday weekend with glorious weather, flat seas and good company - what more can you want! David P, Chris, Dan A, Dan J, Dave W, Alex, Luis, Peter and Hilary, and Dan H and Caroline, made the trek to Dorset after a week of strong winds and mixed forecasts. As before, we stayed at the Woodyhyde Farm camp site, just east of Corfe Castle. Joined by Chris, Peter and Hilary for the day (Dan H not having arrived yet) 9 of us set off eastwards from Lulworth cove. The remaining swell made the first mile a little bouncy as usual - the vertical cliffs exaggerating the waves - until we got to Mupe rocks. The obligatory rock-hopping and cave-exploring along the bay brought us to Worbarrow Tout and a lunch stop at the little Pondfield beach. The weather was turning ever sunnier and we pressed on to Kimmeridge, buzzed by a little police helicopter as we arrived. After an uneventful return trip we indulged in a little rolling and rescue practice in Lulworth Cove to amuse the tourists... For dinner we drove round to the excellent New Inn in the nearby village of Church Knowle, a misnomer as it's many hundreds of years old. Oh, what to do? Another day of sunshine forecast! 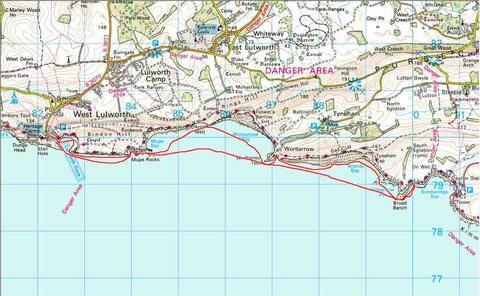 Rather than indulge in the Kimmeridge to Swanage run (and the "car shuttle from hell") we started from Studland beach and pottered round Old Harry Rocks to Ballard Point. We were driven off our lunchtime beach by (a) the blazing heat reflecting back of everything, (b) the wake of a cross-channel ferry which threatened to wash everything away, and finally (c) all the insect life that crawled out of the seaweed on the beach after the ferry had passed. Studland Bay was amazing - seemingly every boat from the marinas in Poole Harbour had come out and parked up en masse! Anyway, a lovely weekend - and just the slog back into London remained. PS2. pure ego trip I know, but I've got a little gallery of scenic S Dorset pix at www.davidp.org.uk/dorset - Ed.